Did you ever imagine Gotham having an otaku scene before this? Cameron Stewart and Brenden Fletcher’s latest caper oozes humor: Barbara visits a geek-toy shop where the mildly condescending cashier can’t believe she hasn’t heard of the artist who’s playing over the speakers. The setup of this issue is it’s Barbara’s first day on campus, and she learns two motorcycles were stolen from her university’s robotics lab. The thieves were dressed in anime garb. 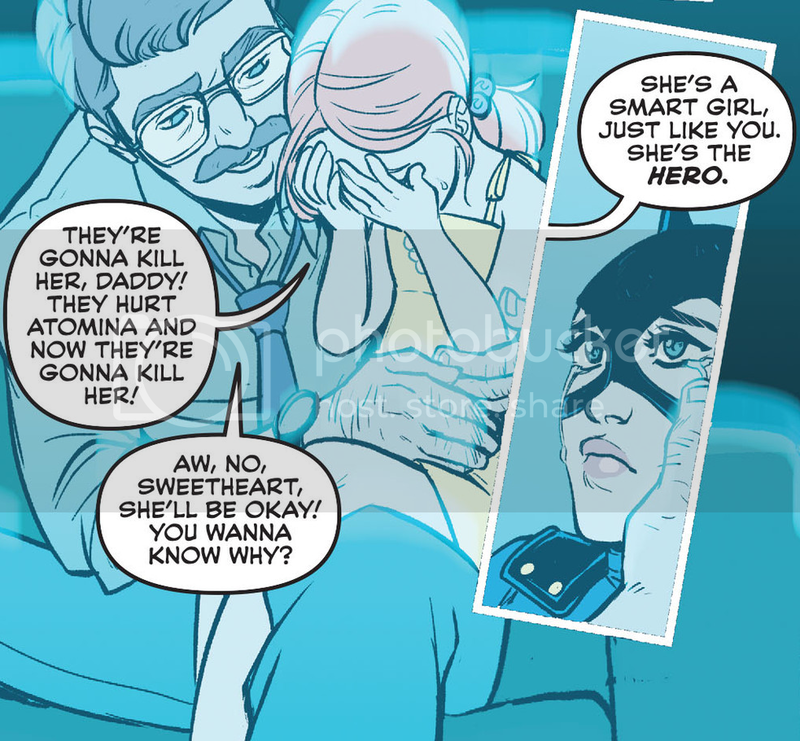 Barbara was a childhood fan of this anime, and the most moving moment in this issue is a flashback to young Barbara watching a scary scene in this anime and being reassured by her dad, Jim Gordon. Cameron Stewart and Brenden Fletcher introduce a flurry of new characters: Jeremy, a possibly very cute young professor in Barbara’s department; Nadimah, a research assistant who comes to her rescue; and Qadir, Nadimah’s brother, who works in the robotics lab. I’m thrilled to see Nadimah and Qadir! 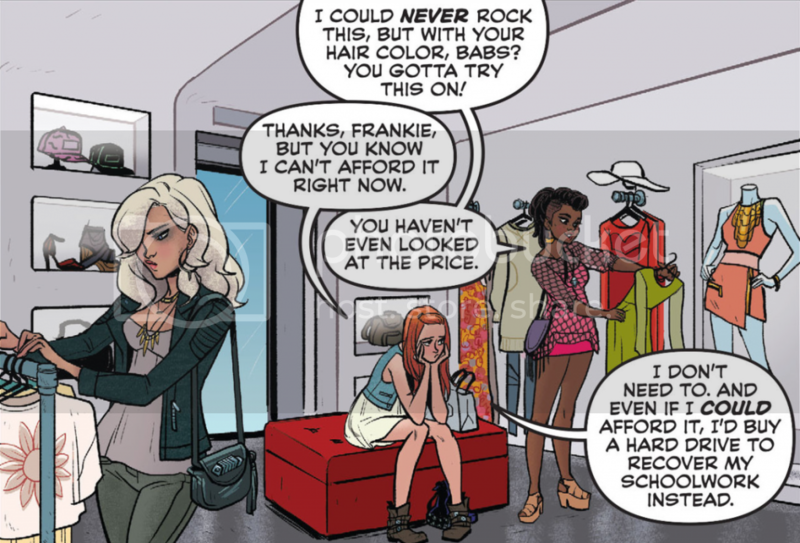 I raved last issue how this creative team gets Barbara’s demographic right. That’s true not only for the representation in the cast, but their outfits. Babs Tarr and Maris Wicks dress Barbara, Frankie, and Dinah in clothes that we can actually see them wearing. I especially like Barbara’s boots in the very first panel. Every character interaction in non-action scenes is entertaining: Barbara and Frankie curled up on the couch with wine and their laptops; Barbara and Qadir geeking out about USB or Thunderbolt. 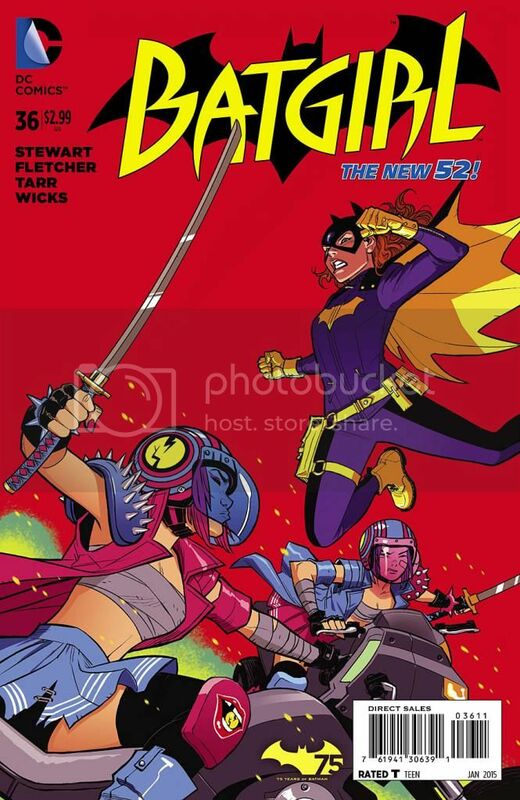 It’s refreshing that Stewart and Fletcher are giving their protagonist real friends, and friendships are central to the plot, instead of just teammates (think: Avengers titles) or romance (think: Daredevil and Elektra). Barbara’s relatability hooked me in this issue from the very first panel. If any book besides Ms. Marvel deserves mainstream attention from those who’ve never read a comic before, it’s this.